NEWARK, Del — B&W Tek announces the TacticID®-1064, a handheld Raman analyzer for real-time identification of suspicious and unknown substances in the field, at the International HazMat Response Teams Conference on Friday, June 8, 2018. It is the latest addition to our existing award winning TacticID family, the state of the art handheld Raman systems specifically designed for safety and security personnel. The TacticID-1064 is superior in material identification with its ability to identify more samples with better accuracy and faster speed than the similar Raman available in the market. It is especially advantageous in measuring difficult street samples such as mixed narcotics, explosives, and hazardous materials. It is based on a most advanced third-generation 1064nm technology, which is a magnitude better in fluorescence elimination, lower level of detection, and provides a much faster response time. It also allows for safe and direct measurement of darker substances. The TacticID-1064 has a large and comprehensive on-board library included but also allows users to create and import customized libraries. Easy touch screen operation or navigation using hardware buttons gives users the flexibility to operate the instrument regardless of the circumstances. The system comes equipped with an on-board camera to capture evidence photos at the scene that are included in the test report, which can be exported directly onto a USB drive for convenience. The TacticID-1064 displays both GHS and NFPA704 chemical safety information, giving additional actionable data. The TacticID-1064 is the newest addition to B&W Tek’s family of world-leading Raman analyzers. 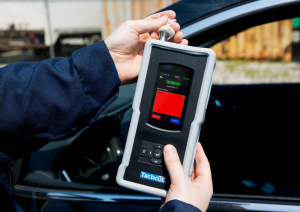 It complements the TacticID-N and TacticID-GP, which have already been adopted by law enforcement personnel and first responders for rapid and nondestructive identification of materials and deliver the ability for low-level detection of opioids. The TacticID-1064 is the high-performance Raman tool of choice for accurate results and safer methods for end users. Request more product info from B&W Tek, Inc (tacticID). Want to know more about B&W Tek, Inc (tacticID)?